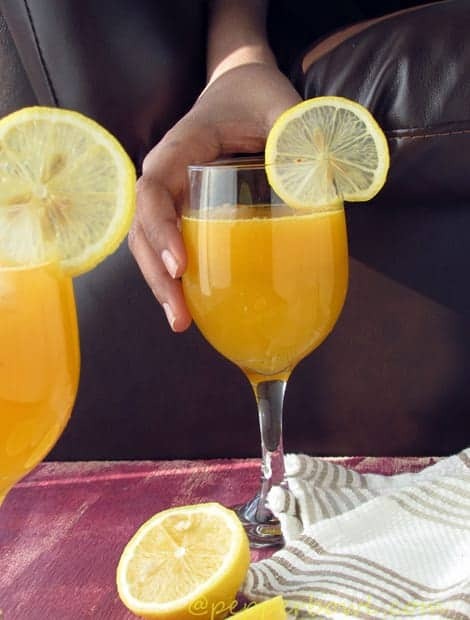 This orange punch non alcoholic recipe is suitable for all occasion. Another extraordinary healthy drink for everyday or for kids birthday parties or baby shower. A perfect delicious non alcoholic summer drink that would be loved by everyone. The best healthy punch ever! Simple, refreshing and energetic drink for all seasons. 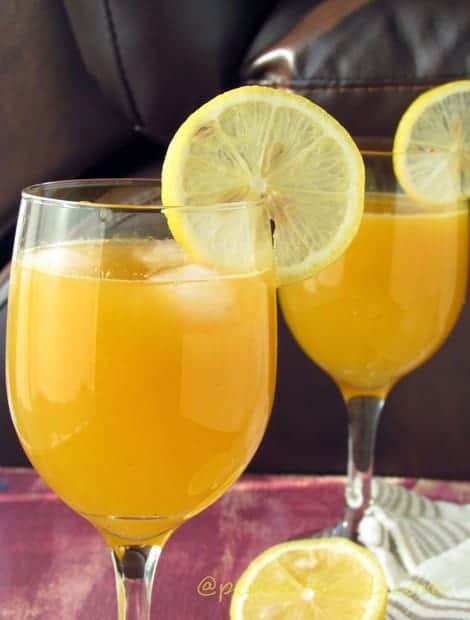 orange punch non alcoholic recipe is a super healthy drink in Non-alcoholic way. But with the same fun and spirit. It’s an excellent energy refresher as it is made with all fresh ingredients like oranges, ginger, and lemon. And these fresh ingredients makes the drink beautiful. They are always the best choice over store bought bottled juices. And be sure to prepare a large quantity as your guest may be asking for more. When talking about quick and easy non alcoholic punch like this, I could come up with this orange punch non alcoholic recipe healthy refresher. And before that, have you checked my other punch recipe? Watermelon punch and Orange spritzer recipes? Like any other family, we usually stock orange juice at home. But I’m not a huge fan of store-bought orange juices, as I feel it is bit tangier. And also I could not bear that tangy taste after my breakfast. Furthermore, I do not wish to go with the sweeter versions of ready-made brands, worrying about the sugar content added to it. Our friends gave these tasty, juicy oranges. These oranges were juicy as I had squeezed with my hands, I felt like a sponge. Very happy that I am going to make the fresh orange punch non alcoholic that is not from any juice concentrate. Planning for Christmas or New year or thanksgiving parties? This recipe would be the lifesaver and gratifies everyone. It is a huge satisfaction as it is simple to make. Likewise, it is a huge satisfaction for the others as it is a delicious drink. Orange punch non alcoholic recipe perfect drink for kids, parties and holidays. Refreshing and straightforward healthy drink made with fresh oranges, ginger, lemon, and ice cubes. Not made from juice concentrate. Best to making cocktails as well. Moreover, Orange punch non alcoholic recipe is a healthy drink packed with readily available pantry ingredients puts together. This as a big glass of cook delight. It is so tasty, as I’m often treating myself and my family with this orange punch non alcoholic drink. So whenever I visit the local market, I grab the most I could especially to make this punch. Like you I too make only orange juice until I tasted in one of the restaurants in Florida. I know Florida oranges are never comparable. But we get here the similar quality fresh oranges in the stores of Pennsylvania. 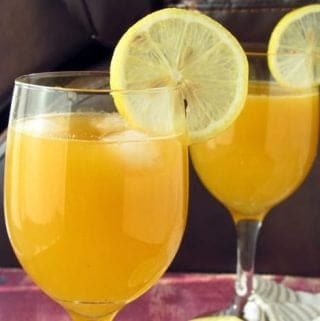 I have included sugar in this orange punch non alcoholic recipe. Instead, you may add natural sweeteners for a healthy addition. On the other hand, you may also add sugar syrup which makes it more comfortable and straightforward during the preparations. Simple syrup cuts down stirring time and does not cause any messes. I could not forget an incident. I asked my son to help me in this stirring part. Of course, he did it. But messing a lot with the dining table. And I have to work double time before everyone could assemble on the table. This incident made me avoid seeking any help on the last minute. I make this orange punch non alcoholic many times with many variations. And every time it does tastes different, with every new ingredient added to it. Every ingredient brings unique flavor and makes this a whole new drink. And every time it surprises with its whole new taste. And this is the most favorite of ours. The ginger gives a real punch, which you never expect it by its look. This zing in it is immense pleasure during the dinner time. The fresh oranges have their instinct refreshing taste boost up this holiday drink. Today I made the orange punch non alcoholic drink with lemon, ginger, and sugar. How does this Orange Juice Punch taste? It is the bundle of flavors of orange and ginger. Since this drink is made from freshly squeezed oranges, it has all the fresh flavors and sweetness of oranges with the hint of ginger and lime. You could feel the tropical flavors and taste in the orange punch. You can also use lime juice instead of lemon juice if you prefer your punch to have the sharp taste. You can substitute sugar with sugar syrup to minimize the preparation time and thereby reduce your work. Add lemon zest for more lemony flavor. We love this variation too. If you are serving for the party and looking for showy variation? then freeze orange juice in ice cube trays. And stir in along with the punch in the pitcher. And this looks classy, with floating orange juice ice cubes in each glass. I’m sure your guest are going to love this. No fresh oranges for orange punch non alcoholic recipe? try this recipe with store-bought orange juice. And this tastes yummy as well. Want to add more fruit juices? Pineapple juice, mango juice are other good complimenting flavors with orange. And these additions will not alter the color of the drink. You may also add fresh-cut fruits lie, strawberry, blueberry, raspberry and others. This looks cute and contrast to the orange punch. And these are also great for the parties. Running out of time for the party? replace fresh orange juice with orange sherbet. Adjust sugar according to the tangy taste of oranges. I personally prefer not to add artificial sugar to any fresh fruit juices. Remove lemon juice from the ingredient list, if oranges taste sour. Add a pinch salt, this is also a tasty alteration. 'Orange Punch Non alcoholic Recipe' a super healthy drink in the non alcoholic way. But with the same fun and spirit. It is a great energy refresher as it is made with all fresh ingredients. And these fresh ingredients makes the drink wonderful. They are always the best choice over store bought bottled juices. Extract the orange juice with the help any citrus extractor. In a pitcher, add the extracted orange juice, lemon juice, grated ginger, and sugar. Taste and adjust the sugar. And our easy orange punch is ready. Serve in tall glasses with the lemon slices. the quantity of the sugar depends on the taste of the oranges. If the oranges are sweeter, then reduce the sugar. If you do not want to feel the ginger bits while drinking, then strain it before serving. My mouth-watering looking at the click…. Hello, sorry to bother you guys. I am unclear about the ginger. I have ginger in its whole form, but don’t know how to add it to this drink. Add it whole?ground it? I’m currently a recovering alcoholic, and would really like to try this. thank you. Sarah, add crushed fresh ginger, for a perfect soothing orange punch. And wishing you all success for speedy recovery from alcohol!! I really appreciate your help, and the well wishes. I’ve taken up cooking different and new things for my family, to keep me busy, and to keep my mind on recovery. So far I’ve had no complaints! BTW, you have a beautiful name. I’m glad to hear that everything goes smoothly. And thanks for the compliment Sarah! !